The Eighty Seven was introduced last year to great critical acclaim. This is part of K2s Volume Shift family. These boards are shorter and wider bringing a surf feel to snowboarding. The K2 Eighty Seven takes a surf inspired viewpoint to any terrain. The Eighty Seven is created by adding Volume Shift to K2s All Terrain shape with Camber Baseline. The Volume Shift means you can downsize the length of the board. K2 suggest anywhere from 5-7cm. 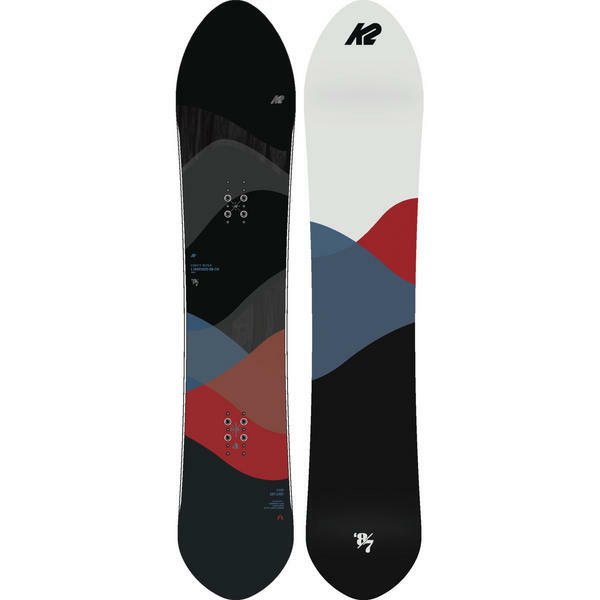 The result is surfy and maneuverable feeling as you sail through the powder and float through the trees and yet on piste the W2 Core, which is made from renewable resources and a layer of Bamboo called the Bambooyah Blend, provides that extra snappy feeling that only bamboo can with a 5 year core warranty, yes 5 years! The Eighty Seven gains extra grip and responsiveness through the Carbon Web II Construction that takes the carbon out past the contact points of the board, while the Camber between the inserts gives control in the carve. Do not fear the size, go short, loosen up and surf the mountain.